MoVida has opened up in Sydney. Yes! The owners of the successful restaurant chain in Melbourne have finally decided to spread their wings and expand their food empire to Sydney. The best part, is that they have also bought along a selection of the classic MoVida dishes. On this unbearably hot summer night, I chose to take my good old friend to MoVida, for a long-overdue catch up. It was so hot that night that I barely had any appetite. Thankfully the back street Surry Hills restaurant had their air conditioner on full blast and the dining area was pleasantly cool. Coupled with the warm and welcoming smile from the floor staff on arrival, my night kicked off to a great start. The setting of the restaurant is casual and cozy. The walls made of raw bricks but much of the internal area has been decked out with a lot of warm-coloured wood. The dark leather seats gave the restaurant a slight edge and adds to the character. Large floor to ceiling windows ensures that as much natural light is allowed in before the sun sets. On the front is a display of their seafood and oysters, to your left is the main dining area and to your right are high-top tables and the bar. We were seated at the bar where we could clearly see all the action behind it! I started the night with an icy glass of Sangria - a Spanish wine punch with fresh fruit. The name of this famous Spanish drink, Sangria, is derived from the Spanish word 'Sangre' which means 'blood'. The blood tasted so good, I ordered a jug to share - why not? 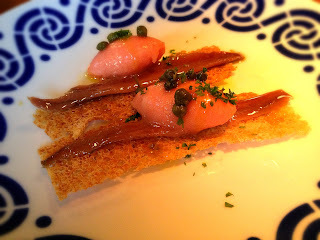 Our first dish was the Anchoa - Artisan Cantabrian Anchovy with smoked tomato sorbet on a flat sourdough crouton. The Spanish take their anchovies very seriously and here at MoVida, they use the finest anchovies from Cantabria. The anchovy meat was firm, meaty and not too salty and balanced out with baby capers and the rustic tang of the smoked tomato sorbet. This dish was heavenly. A recipe to this amazing dish is posted on the MoVida website and I am going to have to give this a try at home soon! 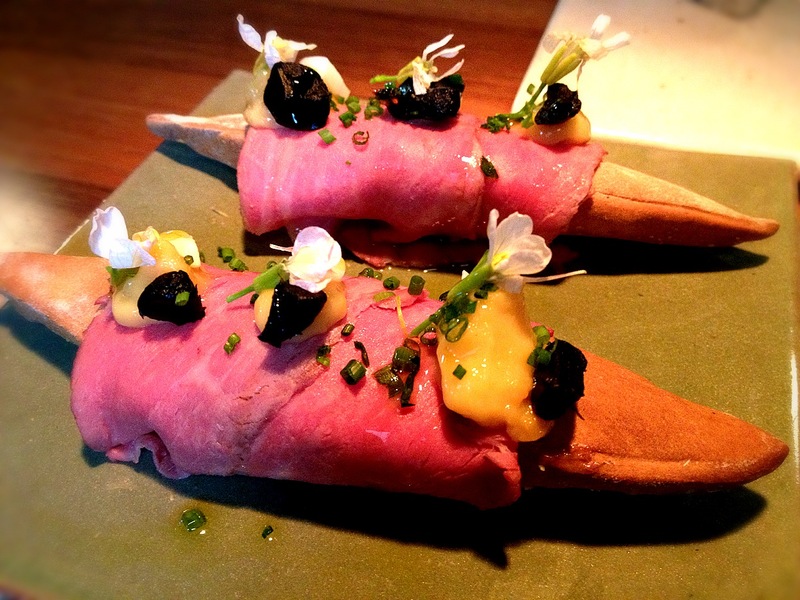 Our next dish was the Bocata De Buey - tender pieces of wagyu wrapped around a hard hollow baguette, topped with tocino de cielo (a Spanish style custard), pickled and black garlic, edible flowers and chopped chives. This dish is bold and is beautiful, and tastes as good as it looks! If asked whether I would change anything, I may suggest a substitute for the air baguette which I found a little too hard for this tender and delicate dish. Then followed the Salmonjero - a thick and creamy tomato puree soup originating from Cordoba in Southern Spain. 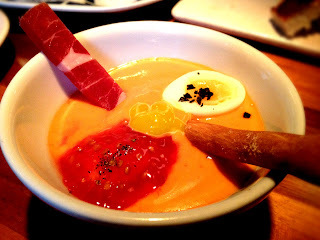 The soup was served chilled with a long chunky piece of jamon and boiled quail egg. Oysters were offered on the menu and again I could not resist and ordered two serves each of the Ostra - Sydney rock oysters shucked to order and served with Manzanilla jelly and compressed watermelon. 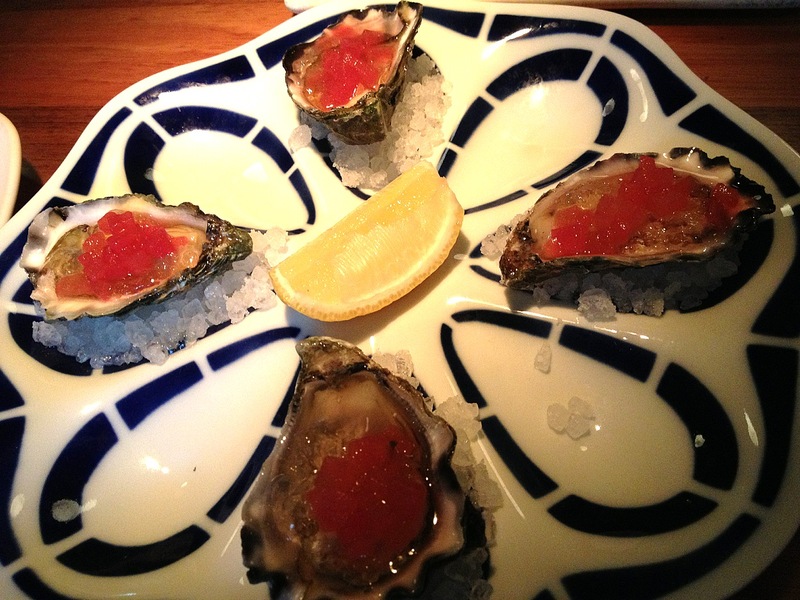 Though the oysters were evidently very fresh and served nicely chilled, I didn't find that the flavours of the condiments worked too well with the creaminess of the rock oysters. Now to my favourite dish for tonight, Cecina - large thinly sliced air cured wagyu beef served with a big dollop of truffle foam topped with a poached egg. The cured wagyu slices were slightly salty and very tender. Prior to eating you would wrap the truffle foam and poached egg with the wagyu into a parcel and cut right into it to enjoy all the flavours together at once. The truffle foam and poached egg harmonised the saltiness of the wagyu and the dish reached a heavenly equilibrium. My taste buds danced a little salsa on the spot and my eyes sparkled so much, the patrons sitting adjacent us immediately ordered a serving too! Our final dish was the Flor Con Calamares - braised zucchini flowers filled with smoked eel brandade and served with grape tomatoes and fresh calamari. 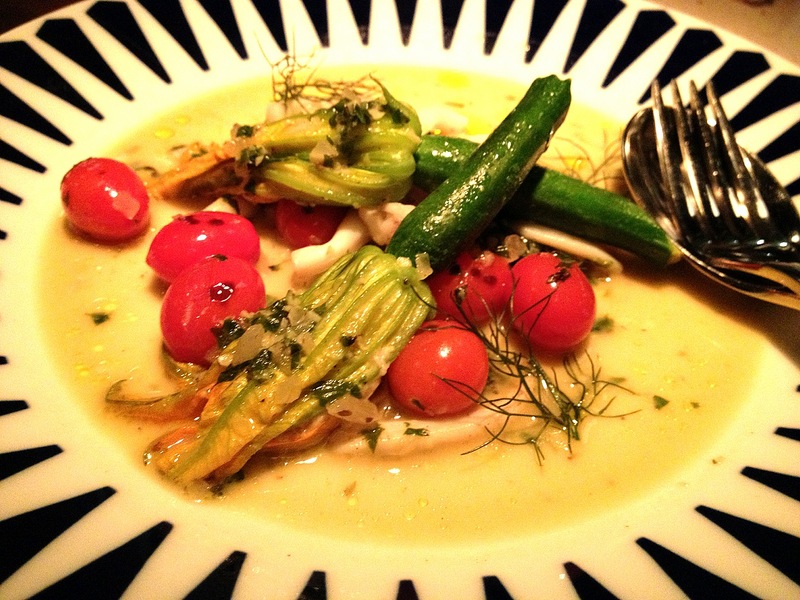 Don't let the appearance of this dish fool you, the calamari was the star of this dish (not the zucchini flowers!). The calamari were very fresh, sweet, juicy and tender. 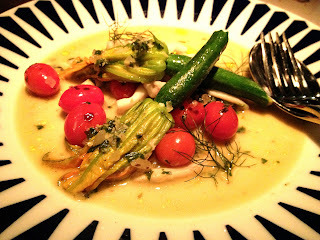 The conclusion - MoVida Sydney was well worth the wait. Bring an old friend or two, arrive early (very early to avoid a long queue - we turned up at 6pm), order a few tapas dishes, pick and chew away, lay back for a relaxed chat and enjoy the warm ambience the restaurant offers. Order again and repeat the process until you are satisfied you have enjoyed the best Frank Camorra has to offer! The service was a bit of hit-and-miss though. Good service is like the icing on a cake and can really make or break a dining experience. Having heard many people rave about the good service at MoVida, I came convinced my old friend would have an enjoyable night, but admittedly left with a bit of disappointment. Perhaps the staff member who served us was having a bad day? Nonetheless, the heart poured into the dishes is evident and I will return.